Who's afraid of the Big Bad Wolf? None of your students will be scared of B. 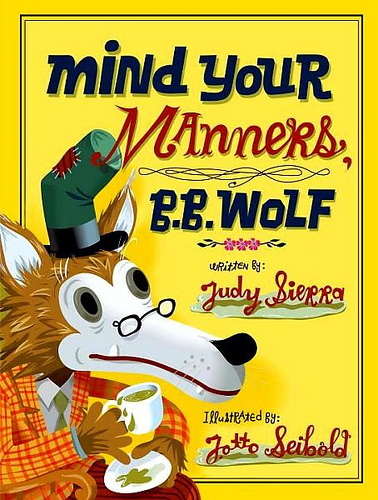 B. Wolf—or good manners—after listening to this story about his excellent etiquette lesson. To prepare students to make text-to-text connections, you might want to first read several classic tales of wolf mischief, such as The Three Little Pigs and Little Red Riding Hood. Even though it is most often a fox and not a wolf that is the danger in The Gingerbread Man, you might also want to read this story because a gingerbread man is featured in the illustrations of this book. Finally, you might also wish to discuss why Little Bo Peep, in the traditional nursery rhyme, would need to be afraid of wolves since they were a danger to her sheep. Prior to reading the story, invite students to choose characters from these classic tales to portray. Options include any of the three pigs, Little Red Riding Hood, her grandmother, the woodsman, and the Gingerbread Man. Group students by their chosen characters, or have them label themselves with nametags. Using a toy microphone, and perhaps even a video camera, interview the characters to find out what they already know about our main character: B. B. Wolf. How have their previous experiences with the wolf affected their opinion of him? What words best describe his personality? What are his motives in most stories? What advice would these characters give to other storybook characters about the wolf? In the story, B. 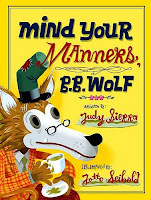 B. Wolf makes up a song to help himself remember the etiquette advice provided by his friend the crocodile. Following your read aloud of the story, invite students to help you create a tune for the crocodile's advice. Perhaps you could try the words to the tune of popular songs that the students already know. Or challenge older students to create their own tunes to perform for the class. If desired, sing the text to the tune of "Bingo." Say, "Excuse me" if you burp. When you go to the library. but don't go biting anyone!